Sunnhemp used as a green manure crop increases the amount of soil available Nitrogen and improves soil organic matter. In a recent paper by Mabuza, Edje and Shongwe, sunnhemp used either as mulch or incorporated into the soil at seven weeks after planting improves soil nitrogen. This practice benefited the subsequent maize crop. There was a remarkable improvement in the performance of the maize crop. “Nitrogen is the nutrient absorbed in the highest amounts by plants especially maize. However, farmers rarely apply the recommended amount of nitrogen fertiliser to their maize crop. This therefore implies that the maize plant is consistently deficient of nitrogen on a yearly basis. This is more so because maize farmers in Swaziland grow maize every season without rotation or fallowing the land”, Mabuza and his colleagues said. In the experiment the researchers showed how varying sunnhemp seed rates intercropped with maize can be used to improve soil nitrogen content. Ideally there could be relayed but to address the problem of land scarcity it is inevitable that these two are intercropped. In the paper they also describe how sunnhemp planted between maize rows of maize. They also show the stage and ways of utilising the sunnhemp as either mulch or soil-incorporated. 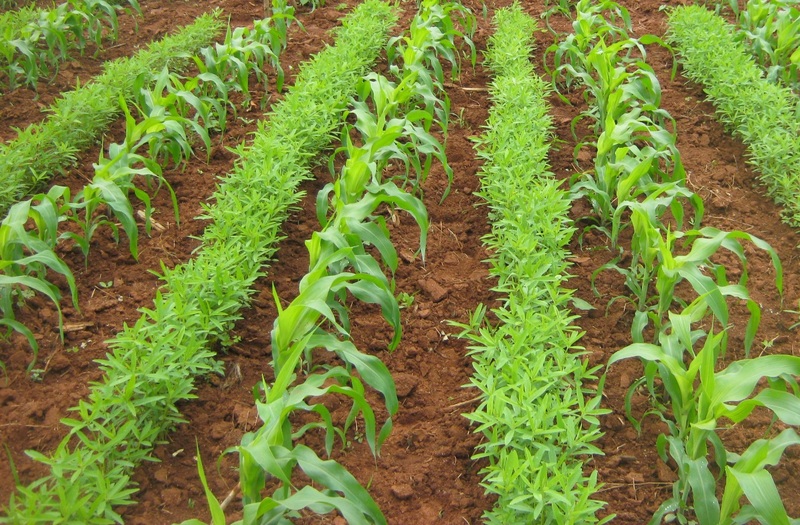 The researchers continue to suggest that the use of sunnhemp as soil incorporated green manure crop is more beneficial to the maize crop than using sunnhemp as mulch. They acknowledge that previous experiments had been done but there was a need to study the effects of different seed rates and then compare the two methods of placement. The use of nitrogen-rich green manure crop is generally the first soil amendment that can be used to correct farmers’ poor soils. Although efforts are being made by governments to have farmers’ soils tested for pH and essential elements, the recommendations are seldom adhered to largely due to limited resources. The use of sunnhemp therefore comes in handy especially given that crop residues are fed to livestock during the winter season. No synthetic fertilisers were added in sunnhemp treatments. It was also important that the labour involved in these two methods is also factored in. When looking at the cost of green manures and comparing them with the benefits, it is important to consider all the benefits. While it is relatively easy to figure the benefits if you can reduce or eliminate pesticide applications, it is far more difficult to estimate the benefits of improving soil physical characteristics, or other long-term benefits. Crop Production Department, University of Swaziland, Luyengo, Swaziland.